If you take away one thing from this post, it should be that AMM Jewelry rocks! I saw her post this necklace on Instagram and thought…I just HAD to have it. I checked back every day for a few weeks and BAM finally it was there. AMM only made 5 of these necklaces, so I definitely felt like I got a one of a kind piece. There are many fun geometric rings, necklaces and earrings going on paired with subtle neutral colors. If you want to check out A Merry Mishaps’ Etsy shop, click here. Not to mention her blog is beyond for home & decor inspiration, find it here. I was also very excited about finding this 1960’s purse for $20 at Scout Living in midtown Sacramento. I love going into this shop because my eyes are overloaded with all sorts of mid century modern wonders. My favorite part is you can marvel at the expensive designer items while still leaving with a $20 purse. I hope you enjoyed this outfit because I feel it just maybe the epitome of Colour Me Classic’s style. I love myself a good boat necked striped tee…and who can say no to a red pump? Enough about me already! What article of clothing is at the root of your style? P.S. I’ve been designing some halloween cards. I will have a free download for you lovelies in the near future! great look for you. 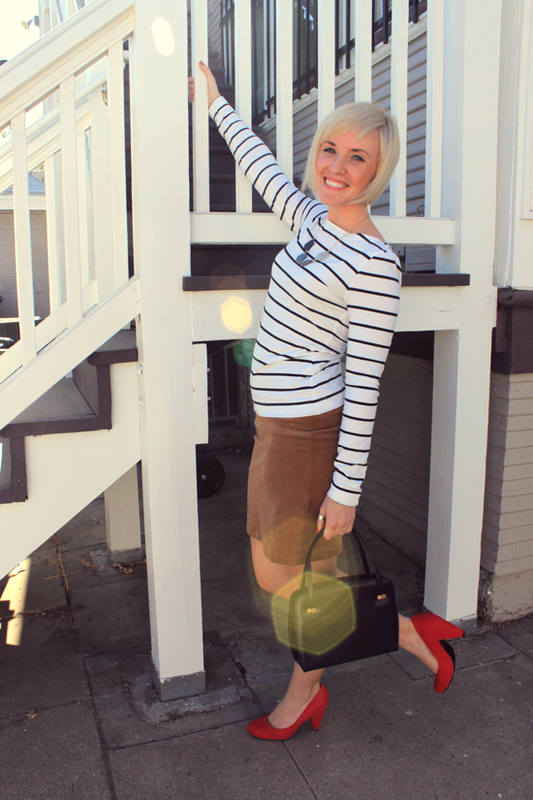 stripes, camel, and a pop of red!!! 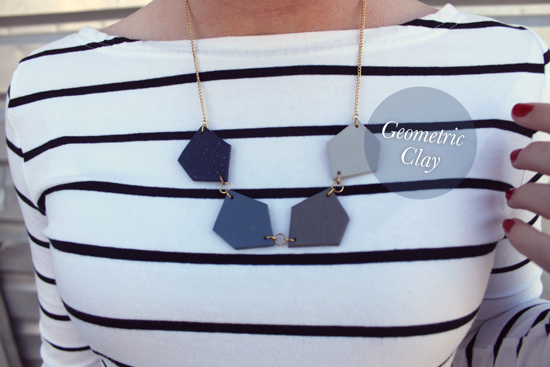 plus the structured bag, geometric necklace & sunspot pictures= perfection! ps, thanks for visiting my blog and I’m giving away some AnnaDellaRusso for H&M, perhaps a bit too gaudy for your style but perhaps as a detail? everything about this works. the red shoes with the camel…with the stripes! BOOM. I love the simpicity of this outfit and your adorable hair cut! You look fab! Gorgeous outfit! I love those shoes!! i totally need those heels! and i love the stripes + camel skirt – very classic and super pretty on you! Thanks for the comment! I love your blog, too! Fabulous images– loving this outfit! I follow you now via Twitter! So nice pics. I like H&M tshirt. Great. Love that top so cute. And I really like that added just a splash of color with those shoes! I love these red shoes, they’re darling! love this whole outfit! you have such a great style!! Those heels are gorgeous… perfect pop of color! Thanks for the comments on my blog. Would you like to follow each other? Love your bag loads! it’s super cute with that boxy shape! What a cute outfit. I love the camel skirt and how you paired it with a striped shirt and pop of red from the shoes is gorgeous. Ps following on facebook and bloglovin’. Those little shows are adorable!! The whole outfit is super cute. I really love this look – the stripes, camel and red work so well together! Love your take on camel. The red heels and statement necklace really make this outfit stand out! omg don’t you love when you score limited edition pieces!! & this outfit is adorable! 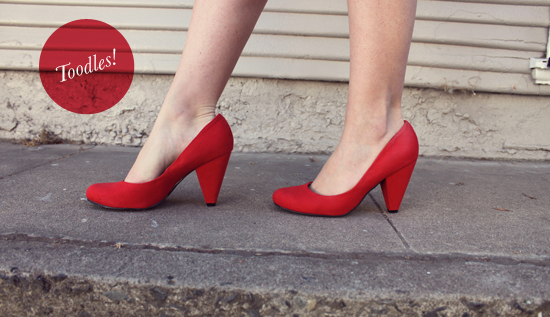 LOVE the pop of red in your shoes! Love the pop of color in those heels! Love this outfit! Glad u found my blog so that I could find yours! New follower! Love this combo! stripes and camel color looks so good! thanks for the comment and keep in touch! Love this outfit! 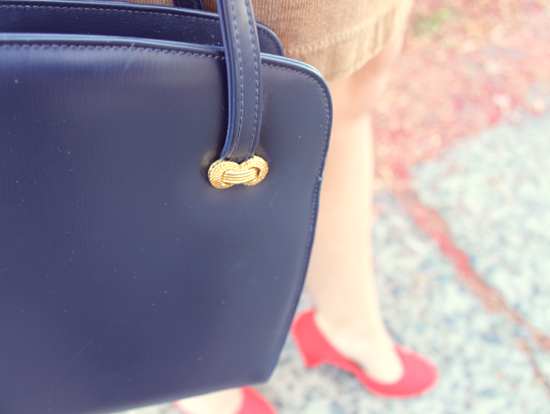 The red heels and that awesome vintage bag are a great combo! Cute blog! Love your style. sooooo cute! love your hair! This outfit is perfection! I love the cordoroy skirt. I resisted tempation to buy one from Old Navy the other day, but I might just have to go back and buy one for myself! love the outfit! the shoes are great for a pop of color. i have that h&m top too! stripes are awesome and go with everything! Love the outfit! You have a new follower! Tan + stripes + red is such a perfectly classic combo! Loving this look! Thanks for your sweet comment! what a cute outfit! love the red shoes! VERY cute! LOVE the skirt & the shoes! BTW… thank you so much for the sweet comment on my blog. Hope you will visit again soon! You look absolutely adorable! I am in love with that cute bag and I would wear that necklace instantly. Gorgeous! Thanks ever so much for your loveliest comment on my blog. It means the world to me. Your striped top is So chic! I love the subtle touches of color you’ve added into your neutral outfit! My beautiful daughter. Great look and hair..
AH I love this outfit! reminds me of my best friend courtney who loves nautical stuff! it’s classy nautical! the shoes really make the outfit. Love that outfit- the red shoes make it perfect! 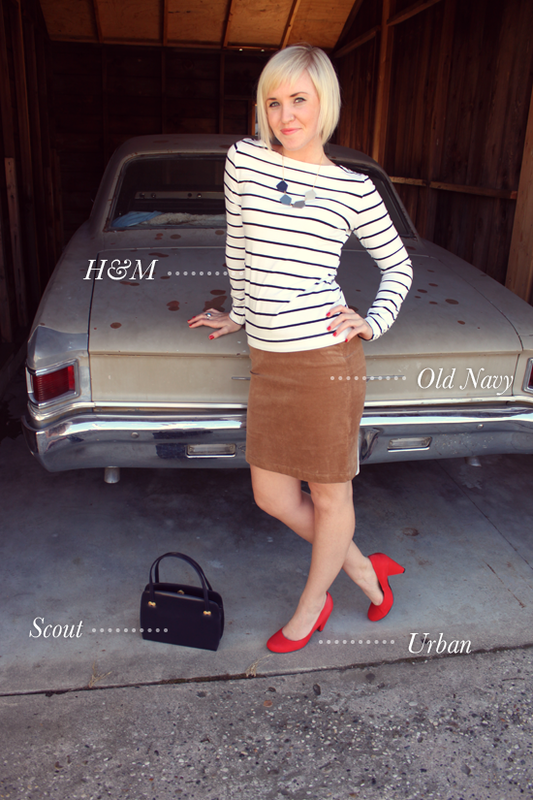 This really does live up to your blog’s name- it is definitely a classic (and classy) look!